Nearly all of these two million young American men were given a high stakes test called the Army Alpha Beta Test.According to the US Army, the Alpha Beta test measured "verbal ability, numerical ability, ability to follow directions and knowledge of information". Scores on the Army Alpha Beta testwere used to determine “a soldier's capability of serving, his job classification, and his potential for a leadership position.” The reason it was high stakes was that if you failed the test, you would be a foot soldier, also known as cannon fodder, which would greatly increase your chances of dying in the war. If you passed the test, your odds of living were much higher. We will get back to this test in a minute. Here is where my personal story comes in. My great grandmother, Ella Olson, was from Oslo, Norway. In the 1890's, she was told that “everyone in America was rich.” So at the age of 16, she boarded a steam ship from Olso Norway to Ellis Island in New York. The ticket cost $20 and was paid for by a couple from New York looking for a Norwegian maid. Ella agreed to work as a servant for this couple for two years to pay off the $20 debt. She intended to marry a rich American. Instead, when her two years of being a servant were up, Ella got a train ticket to North Dakota and married a poor Norwegian farmer at the age of 18. Around 1900, they had their first son named Minton. A few years later, they had my grandmother Alice. The thing about farming is that there is no need to learn English and there is no need to learn to read. Everyone in their community could speak Norwegian and they were all farmers. So when the summer of 1917 came, Minton was 17 and he enlisted in the Army. One of Minton's first tasks that fall of 1917 was to take the Army Alpha Beta Test. The Army Alpha Beta Test was an “adaptive” test, like the Common Core SBAC test. This means that depending on your answer to the first question, you would be given a different test. With adaptive tests, not everyone receives the same test. This can lead to unfair testing. This is one of many reasons I am opposed to the SBAC test. With the Army Alpha Beta Test, the first question was this: CAN YOU READ ENGLISH? In Minton's case, and in the case of most Norwegian farmer immigrants, the answer was no. This was also the answer of most African Americans. Here is the adaptive part of the Army test. Those who could read English were given the Army Alpha test and those who could not read English were given the Army Beta test. Each test had 20 questions. Here is the first question on the Army Alpha Test: #1: A company advanced 6 miles and retreated 2 miles. How far was it then from its first position? Now imagine that you are a Norwegian farm boy named Minton or a poor African American boy from the Deep South. Imagine that your life may depend on getting the answers to this test correct. 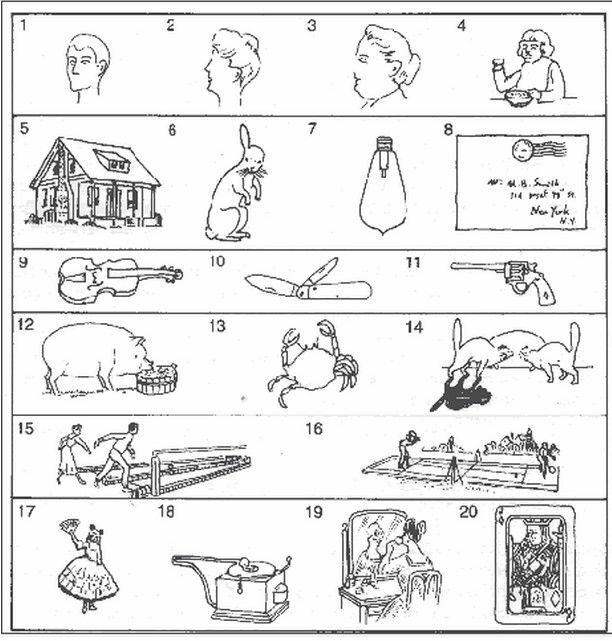 Look very carefully at each image and see if you know all 20 answers. I didn't. Numbers One through Four are pretty obvious. The answers are mouth, eye, nose and hand. 5 is a little harder. The answer is Chimney. All houses must have chimneys. Apparently, the author of the test, who was a wealthy white person, did not understand that many poor Norwegians and poor African Americans did not have houses with chimneys. Some did not have houses at all. 6 was Ear. 7 was Filament. But here is the problem with 7. Electric power and electric lights did not reach poor Norwegian farmers in North Dakota until the 1930s with FDR. Minton had no idea what a light bulb looked like. 8 was equally hard. The answer is Return Address. Poor farmers in North Dakota did not mail letters and did not know the rules of the US post office. 9 was Strings. 10 was Corkscrew (I still do not get that answer). 11 was Trigger. 12 was Tail. 13 was claw. 14 was Shadow. Now imagine you are a farm boy looking at 15 and 16. They kind of look like a couple throwing seeds in a field. But in fact, 15 is supposed to be an image of a couple at a bowling alley. They are missing the bowling balls. 16 is a couple playing tennis. They are missing the tennis net. How many farmers in North Dakota in 1917 do you figure went out bowling and playing tennis? The answer was ZERO. How many poor young blacks played bowling and tennis? Not many. 17 was Arm. 18 was Speaker. 19 was Arm in Mirror and 20 was Diamond. 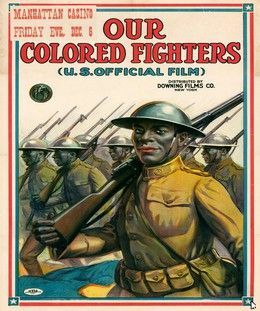 According to research by Glen Yeadon and John Hawkins, 47 Percent of all whites and 89 percent of all Blacks failed the Army Beta test. Any test that over half of all participants fail is called a “high failure rate” test. The Common Core SBAC test is also a high failure rate test because it is deliberately designed so that 67% of all 11th graders who take the math portion of the test will fail the test. This is another of the many reasons I am opposed to the Common Core SBAC test. My grand uncle Minton was one of those who failed the Army Beta test. As a consequence, Minton became a foot soldier. Minton died in Trench Warfare in Europe less than one year later in the summer of 1918. He was one of 117,000 US troops killed in World War One. Another 200,000 US troops – mostly foot soldiers - were wounded in World War One – the War to End All Wars. Or so we were told. Those who passed the Army Alpha Beta test went on to become officers who ordered the foot soldiers to their deaths. 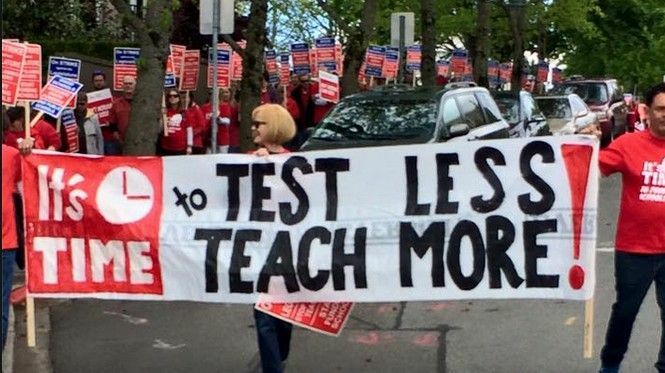 I also commend the Washington Education Association Representatives Assembly which recently passed resolutions opposing costly and excessive high stakes testing in Washington state. All high stakes high failure rate tests are morally wrong and are a crime against our children. As I will explain in my next article, high stakes tests are not even a fair or reliable method of determining career and college readiness. The only purpose high stakes tests serve is to increase profits of Wall Street corporations. 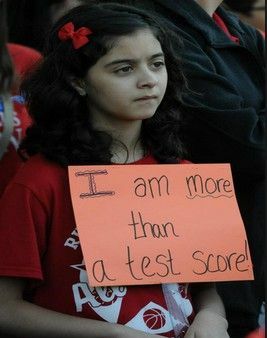 That is why I am working on a bill to end high stakes testing here in Washington state. This article is dedicated to my great grandmother Ella, my grandmother Alice and my grand uncle Minton. I have not forgotten any of you. And I never will.